The Chinese form the second largest ethnic group in Malaysia and constitute approximately 24.6% of the total Malaysian population of 29 million (2012 estimates). The first Chinese arrived in Malaysia in the 13th century as traders. The waves of Chinese immigration continued down the ages with the strongest wave occurring in the 19th century. These Chinese immigrants hailed from various regions in China and spoke various dialects like Hakka, Hokkien, Teochew, Cantonese and so forth. As they settled in Malaysia, the Chinese immigrants who were largely Buddhist built many magnificent temples around Malaysia, many of which are landmark tourist attractions today. This elaborately adorned, six-tiered Chinese temple is a popular tourist attraction situated in the heart of Kuala Lumpur city. 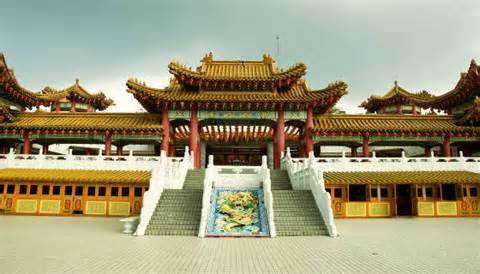 Thought to be one of the biggest Chinese temples in the country, it is dedicated to Thean Hou(the heavenly goddess). The temple sports an ornate roof and is adorned with several intricately carved sculptured dragons. Other popular Chinese deities like Kuan Yin (the Goddess of Mercy) and Shui Wey (Goddess of Hokkien fishermen) also have representations at the Thean Hou temple. The grounds of the temple are further outfitted with replicas of Chinese zodiac while scores of souvenir stores line the outer boundaries of this extremely popular landmark. 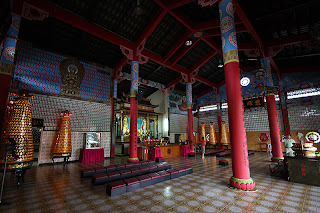 The Fo Guang Shan Dong Zen temple was founded in Jenjarom, Kuala Langat in 1994. The temple, which also functions as a monastery and a center of learning, stands on an immaculately landscaped plot that extends over 16 acres. The main shrine at the temple is a bronze 5.4-meter tall statue of Lord Buddha though the temple also features several other statues like an idol of Kuan Yin (the Goddess of Mercy). The state of Perak is known for its many cave temples, many of which are located around its capital city, Ipoh. Perak Tong is one such famous cave temple, housed within the huge limestone cave; Gunung Tasek situated at a distance of six kilometers north of Ipoh town. Built by Buddhist monks from China in 1926, it is adorned with over 40 statues of Lord Buddha, including one, which rises to a height of 12.8 meters. Chinese paintings depicting Buddhist folk tales adorn the rugged walls of the temple. The San Poh Tong is located five kilometers to the south of Ipoh, near Gunung Rapat. The temple hosts several statues of Lord Buddha amongst its many stunning stalactite and stalagmite limestone formations. It is believed that the cave was discovered by a Chinese monk, who used it as a mediation site. Another important architectural feature of the cave temple are its 246 steps, leading to its summit. The Kek Lok Si Temple is one of the most prominent tourist attractions in Penang. Situated within the town of Air Itam, on the lower rungs of Penang Hill, this magnificent temple is considered to be the finest Buddhist temple in all of Southeast Asia. This tiered temple displays Sino-Thai-Burmese architectural elements and is adorned with several imposing structures like a seven-storied Pagoda featuring ten thousand Buddha figurines and a 30-meter (90 feet) tall statue of Kuan Yin (the Goddess of Mercy) along with many colorful frescoes and water bodies. The Kuan Yin Teng temple, which dates back to 1801, was built by early Chinese settlers in Penang. This ancient temple honors two main goddess; Kuan Yin (the goddess of Mercy) and Ma Chor Poh, the patron saint of seafarers. The temple features a rather dramatic décor as its main hall is supported by intricately carved pillars that feature many sculpted dragons. In heart of Melaka’s Chinatown district stands the oldest Chinese temple in Malaysia. The Temple of Bright Clouds or the Cheng Hoong Teng temple, which dates back to 1646, is believed to have entirely been built from materials imported from Southern China. The three main doctrines associated with Chinese religion Buddhism, Taoism and Confucianism, are practiced at the temple. The Malaysia state of Sabah on Borneo is home to many magnificent Buddhist temples. 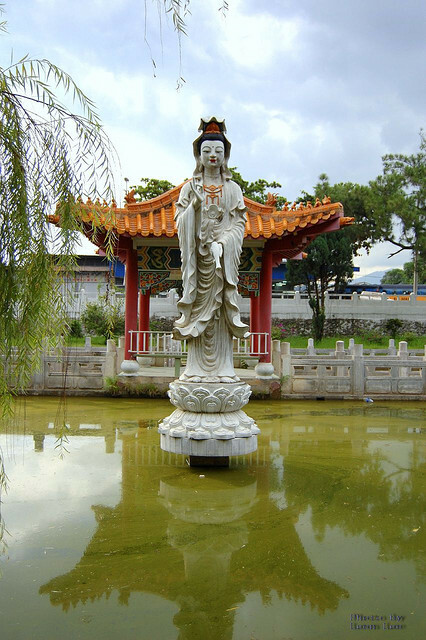 The Puh Toh Tze temple situated 15km from the capital city of Kota Kinabalu is one such well-known Buddhist temple. The temple which was established in 1980, features typical Chinese architectural elements in the form of its structure and its roof. The temple additionally features ten large statues including a giant statue of Chinese goddess of Mercy; Kuan Yin at is main entrance. If you enjoy visiting temples then you are in for a treat in Malaysia, for the country is littered with many magnificent Chinese and Buddhist temples, which provide much insight into the culture and heritage of the second largest ethnic group resident in Malaysia.